Collie was used to herd and guard sheep and to drive the sheep to market in the 1800s in Scotland, but it was in England in the late 1800s that the breed we know today began to take shape. The Collie dog breed didn’t catch the public’s eye until the publication of Alfred Payson Terhune’s (1872–1942) stories and books about his treasured Collies: Lad, Wolf, and Bob. When Lassie was introduced in movies, books, and on television, the public was reminded of these beautiful dogs, and their popularity soared again. The breed’s long wedge-shape head is unique and instantly recognizable. Standing 22 to 26 inches tall and weighing 55 to 75 pounds, with females smaller than males, the Collie should be lean with no extra weight. The rough coat variety has a long double coat with a lush mane, well-feathered legs, and a plumed tail. The smooth coat variety has a short, dense double coat with no feathering. Collies may be sable and white, tricolored, blue merle, and white. 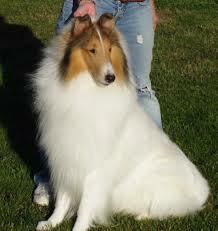 The smooth variety needs twice weekly brushing, but the rough Collie’s coat takes considerably more work. Both the smooth Collie and rough Collie shed, and shed a lot during the spring and fall. In addition, the rough coat can tangle and mat. A daily brushing and combing can keep the coat looking good, keep the hair in the house to a minimum, and prevent mats from forming. A vigorous walk morning and evening and a fast game of catch will keep most Collies happy. A bored Collie who is not exercised regularly will get into trouble. Every dog and owner should attend a basic obedience class together. You may want to continue your training, attend advanced training, or learn how to participate in dog sports. A well-trained Collie can be a wonderful family companion. Collies are loyal to a fault, great with children, and watchful of the home. As dedicated watchdogs, some Collies bark too much, which is annoying to neighbors, but training can help temper that trait. Health problems include a sensitivity to heartworm preventatives, eye defects, gastric bloat, and torsion. Note: Upload only Collie picture or your picture with Collie below - spammer's ip may be blocked. 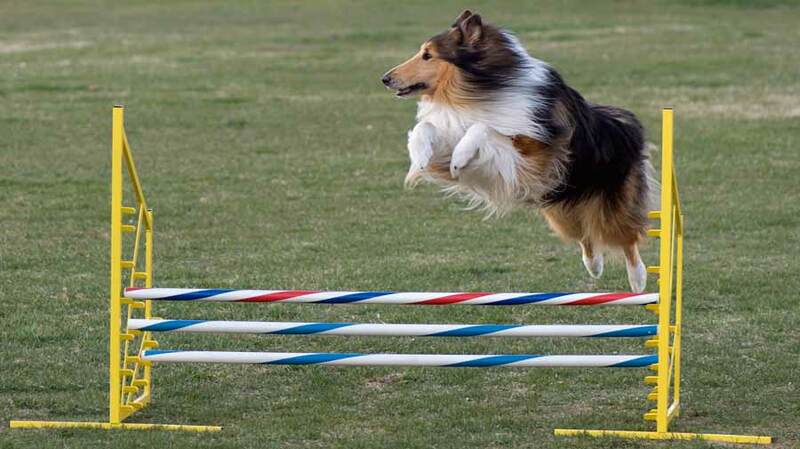 Though they have a working heritage as a herding breed, modern Collies need only moderate exercise. But they need a great deal more personal attention — Collies become unhappy if left for long periods of time without the companionship of people or other pets, and unhappiness can result in chronic barking or destructive chewing. Collies have a soft, sweet personality. They do not do well in an environment with frequent tension or loud voices. 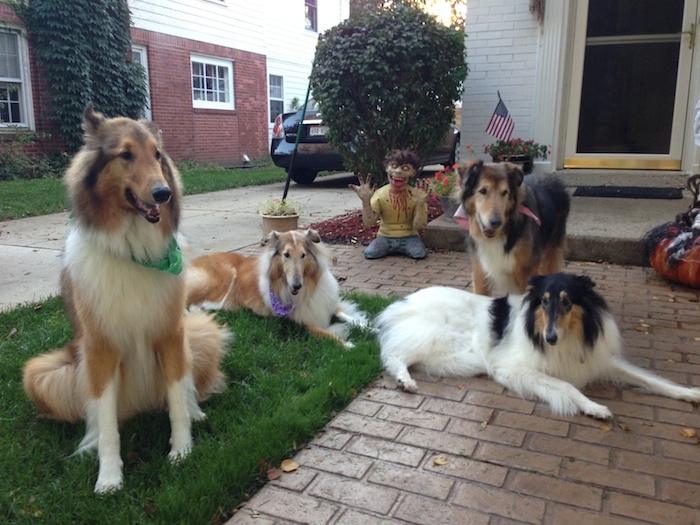 Collies are peaceful with other pets and polite with strangers. As with most sweet-natured breeds, there is potential for timidity; young Collies need to be thoroughly socialized in order to build a confident temperament. Collies can have a mild stubborn streak, but they’re easy to train if you maintain a calm voice and a light hand on the leash. Sensitivity is one of the hallmarks of this breed. Often they need only verbal corrections, and they become confused and skittish if you jerk them around. Praise, gentle guidance, and food rewards are all that is needed with most Collies. Some individuals, unfortunately, can be hypersensitive and highstrung. The most common behavioral issue is excessive barking (typically when bored and left outside). >Smooth Collies, in general, are more energetic, more athletic and agile, more outgoing, and retain more working instincts. Rough Collies, in general, are calmer and more reserved. Some say Smooth Collies tend to be extroverts, and Rough Collies tend to be introverts. Always look for a rescued dog before you buy one. My rough collie, Maggie, is a sable and white large female. She was my son’s constant companion when he was little and now that he is 14 and she is 10 she has become my granddaughter’s best buddy. When my granddaughter naps she sits guard by her bed and even keeps the active 20 mo. old from trying to climb on furniture. One day my son left the front door open and my granddaughter “took off” for the door. Maggie shot in front of her and alerted me with her more serious bark. With this wonderful dog I feel that I have a set of eyes in the back of my head at all times. She’s devoted and loving – I would highly recommend this breed to anyone with children. Collies in general, Rough or Smooth, are lovely companions, devoted to their families, willing to go anywhere and do almost anything with you. Fortunately, most families do not have children like little Timmy, who every week could be counted on to find a new way to test Lassie’s devotion and willingness to, yet once again, get an adult to come to Timmy’s aid. Collies, developed as herding dogs, are usually content to transfer their loyalty to shepherding and protecting a flock of sheep, to a child or children. So if you have a small or large flock of children, a Collie will help you watch over them. While Collie puppies are so adorable they practically hurt your eyes, this is a great breed to consider adopting as young adults, mature dogs, and seniors. Like really good wine and stinky cheese, Collies just get better with age. I would argue that a Collie’s training also improves with age. Unlike some breeds that are quick to pick up everything and also fall all over themselves to please people (okay, I am thinking of Retrievers here) Collies remind me of C students. They’re willing to do the work, they may take a little longer to remember it than the A students, they are just as willing to leave class early and don’t generally feel cheated out of their education if you let them play longer and work a little less – but over time what they learn sticks with them and can be counted on as a solid base of knowledge. Jenny has won over a number of people who were not previously Collie people; sometimes people just see hair and don’t realize the great package that is inside the furry body. Like most Collies, Jenny is gentle, reasonably obedient, a sweet soul who wants to get along with everyone and is willing to tolerate all other life forms. She likes children, herds cats, and provides warning when something is seriously out of place; she was the only animal I live with who bothered to wake me up when the neighbor’s house caught on fire one night. Aside from being a fine looking canine, Collies do well as family members with all kinds of families. They can be calm with elderly and very small children. They can be active joggers, walkers, or agility dogs. They also look good sitting on the seat in your car, truck, or mini-van. They’ll fit in a Mini-Cooper or look right at home in a Cadillac. A Collie can dress up any car, or make anyone look a little more rugged and willing to head into the outdoors. Collies will love everyone in the family. 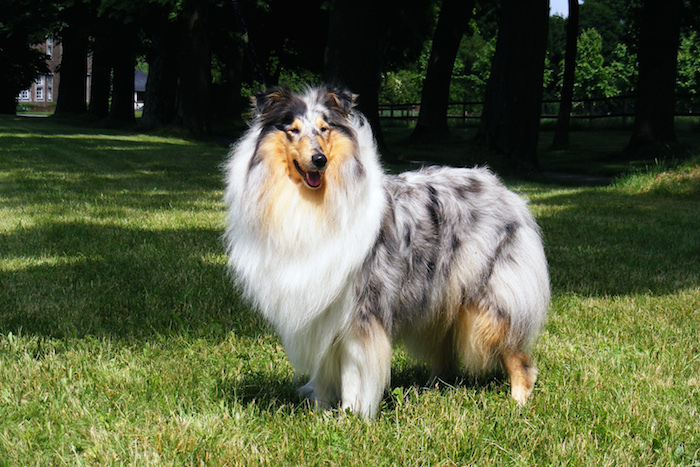 If you enjoy brushing then get a rough collie; enjoy less brushing, then the same great temperament, and range of colors, are available in the smooth variety. Collies are so great in fact, that even when they’re mixed in with other breeds – like my friend Ruby – you still get a fantastic dog. If you prefer your Collies with a little something else mixed in, just check out Petfinder for your next potential family member. Ruby was adopted from a shelter. Shelters, purebred rescues, private citizens rehoming — all possible ways to locate your own wonderful Collie. Collies like to walk, they need some brushing, they don’t shed any more than a Labrador in my opinion (actually, Jenny sheds less than Lil her little Lab sister), they will help with any herding chores you may have, and they will look good while doing so. One does have to be a little more careful with the meds they are given – for example, many have an inherited predisposition to being poisoned by certain wormers/heartworm preventions – however there are alternatives available in the same locations you buy other heartworm prevention. (Check out MRD1 online – multiple drug resistance.) You can now have your Collie tested for MRD1.